Fritz Kreisler (February 2, 1875 – January 29, 1962) was an Austrian-born violinist and composer; one of the most famous violinists of his day. He is noted for his sweet tone and expressive phrasing. Like many great violinists of his generation, he produced a characteristic sound, which was immediately recognizable as his own. Although he was a violinist of the Franco-Belgian school, his style is nonetheless reminiscent of the gemütlich (cozy) lifestyle of pre-war Vienna. Kreisler was born in Vienna to a Jewish father and a Roman Catholic mother; he was baptised at age twelve. He studied at the Vienna Conservatory and in Paris, where his teachers included Anton Bruckner, Léo Delibes, Jakob Dont, Joseph Hellmesberger, Jr., Joseph Massart, and Jules Massenet. He made his United States debut at Steinway Hall in New York City on November 10, 1888, and his first tour of the United States in 1888/1889 with Moriz Rosenthal, then returned to Austria and applied for a position in the Vienna Philharmonic. He was turned down by the concertmaster Arnold Rosé. Hearing a recording of the Rosé Quartet it is easy to hear why - Rosé was sparing in his use of vibrato, and Kreisler would not have blended successfully with the orchestra's violin section. As a result, he left music to study medicine. He spent a brief time in the army before returning to the violin in 1899, giving a concert with the Berlin Philharmonic conducted by Arthur Nikisch. It was this concert and a series of American tours from 1901 to 1903 that brought him real acclaim. On April 26th, 1941, he was involved in the first of two traffic accidents that marked his life. Struck by a truck while crossing a street in New York, he fractured his skull, and was in a coma for over a week, as reported by Life magazine on May 12, 1941 (pp. 32-33). Towards the end of his life, he was in another accident while traveling in an automobile, and spent his last days blind and deaf from that accident, but he "radiated a gentleness and refinement not unlike his music," according to Archbishop Fulton J. Sheen who visited him frequently during that time (Kreisler and his wife were converts to Catholicism). He died in New York City in 1962 and was interred in a private mausoleum in Woodlawn Cemetery, Bronx, NY. The mausoleum of Fritz Kreisler in Woodlawn CemeteryKreisler wrote a number of pieces for the violin, including solos for encores, such as "Liebesleid" and "Liebesfreud". Some of Kreisler's compositions were pastiches in an ostensible style of other composers, originally ascribed to earlier composers such as Gaetano Pugnani, Giuseppe Tartini, Jacques Marnier Companie, and Antonio Vivaldi. When Kreisler revealed in 1935 that they were actually by him and critics complained, Kreisler answered that critics had already deemed the compositions worthy: "The name changes, the value remains" he said. He also wrote operettas including Apple Blossoms in 1919 and Sissy in 1932, a string quartet and cadenzas, including ones for the Brahms D major violin concerto, the Paganini D major violin concerto, and the Beethoven D major violin concerto. His cadenza for the Beethoven concerto is the one most often employed by violinists today. He performed and recorded his own version of the Paganini D major violin concerto-first movement. This version is rescored and in some places reharmonised. The orchestral introduction is completely rewritten in some places. The overall effect is of a late nineteenth century work. 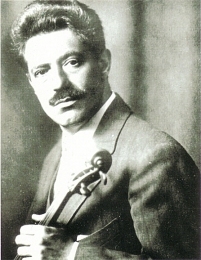 Kreisler owned several antique violins by luthiers Antonio Stradivari, Pietro Guarneri, Giuseppe Guarneri, and Carlo Bergonzi, most of which eventually came to bear his name. He also owned a Jean-Baptiste Vuillaume violin of 1860, which he often used as his second fiddle, and which he often loaned to the young prodigy Josef Hassid. Kreisler's work has been reasonably well represented on both LP and CD reissues. Original masters were made on RCA Victor and HMV. His final recordings were made in 1950. As usual with remasterings of 78rpm original, the sound quality varies widely - worn sources, excessive signal processing are common. Recent British EMI re-releases are generally pleasant sounding. The RCA/Victor reissues on LP suffer from aggressive low pass filtering of otherwise exceptional source material. Angel/EMI reissues on LP (Great Recordings of the Century series) are quite muddy. The 4CD album currently available as Membran Q222141-444 features a cross section of his repertoire, but has audio compromised by extremely invasive DSP.